HouseCall provides a quick and easy check for threats regardless of the protection status of your existing security solution. For more information about HouseCall, please read the Frequently Asked Questions. Full system and custom scan options allow users to specify which folders to scan (new in 7.1). Quick scan option offers targeted scanning of critical system areas and active threats, reducing scan times to within a few minutes. Stand-alone, browser-independent implementation eliminates compatibility issues associated with browser-activated scanners. Smart Scan technology refers to patterns in the cloud, delivering the latest protection while reducing download times. Smart Feedback shares threat information with the Smart Protection Network, which correlates data from a global intelligence network to quickly discover new threats. Review and restore lets you check and compare scan results and recover files. Enhanced detection and cleanup addresses rootkits and other sophisticated threats. Click Download HouseCall to begin. 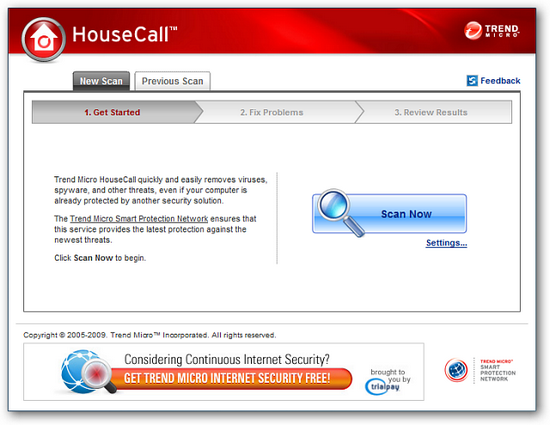 Please note that HouseCall requires a small download before it can scan your computer. You can choose to save a copy of the launcher (HousecallLauncher.exe) and use it to quickly starts scan. Remember to visit this page occasionally to get the latest copy of the launcher.